The Joh n Rex Endowment, a non-profit organization based in North Carolina, supports the well-being and health of children in Wake County. The organization, which was established over a decade ago, has had the same website since its inception. Rex approached New Media Campaigns to create an updated, elegant, and simple site that reflects the organization. NMC developers created a responsive site on the HiFi Content Management System for Rex. The site has a great and intuitive layout on desktop, tablet and mobile devices. The custom site design features images of children and teens that the organization aims to serve. Visitors can easily learn more about Rex Endowment’s history, and read about the organization’s mission on the site. Grant information is featured prominently on the site. Grantseekers can learn about upcoming deadlines on the homepage. 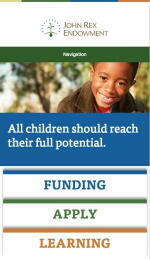 There are areas of the site that clearly describe the guidelines for receiving funding from the organization. Visitors can quickly learn about news affiliated with the organization by reading the news feature on the homepage. The site design is clean and modern. Bold shades of blue, green, and yellow serve as accent colors on the site. The design, and the photos that are incorporated in the site reflect the positive, active, and healthy lifestyle that the organization promotes.